Dino Delight Video Slot Guide & Review - Casino Answers! Dino Delight is a 5-reel, 25-line video slot, featuring wild substitute symbol, scatter wins, multipliers, a free spins feature, side bets and a bonus game. You can play the Dino Delight video slot at [Americans: Unfortunately due to legal restrictions you are unable to play at any of the online casinos this game is at. We recommend you trying playing the unique slots at Win A Day Casino instead.]. Bets on the Dino Delight slot machine are $0.01, $0.02, $0.03, $0.04, $0.05, $0.10, $0.15, $0.20, $0.25, $0.50, $0.75, and every increment of $1 up to $20. You can select from 1-25 paylines. The lowest total bet on the Dino Delight video slot is a penny per spin up to the highest total bet of $500 per spin. The betting range is very extensive, making Dino Delight both a casual player slot as well as a high rollers slot. There is an autoplay mode where you can play up to 99 autoplay spins at a time. To play all 25 lines on the Dino Delight video slot, hit the “Bet Max” button or use the “Spin” button for any other wagers. 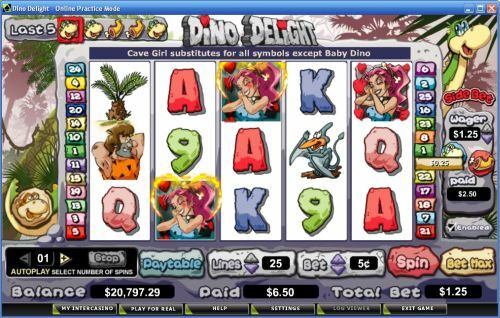 The highest paying symbol on the Dino Delight online slot is the Cave Girl symbol. If you hit 5 Cave Girl symbols on a selected payline, you will win the 10,000 coin top jackpot. The Cave Girl symbol is wild and will substitute for all symbols except for the Scattered Baby Dino. The next highest paying symbols on the Dino Delight video slot are the Caveman (3000 coins) and the Triceratops (1500 coins). You can win these payouts on the Dino Delight slot game when you play at [Americans: Unfortunately due to legal restrictions you are unable to play at any of the online casinos this game is at. We recommend you trying playing the unique slots at Win A Day Casino instead.]. Behind the reels at all times on the Dino Delight video slot is a dinosaur with a coin on his tail. This becomes an active part of the slot game when you enable the Double-Up Side Bet feature which is located at the left side of the screen. You can choose Heads or Tails and bet $0.01, $0.02, $0.05, $0.10, $0.25, $0.50, $1 or $1.25 per spin, which will be added to your bet per spin. The last 5 symbols to have come up are located in the top-left corner of the screen. Whenever you predict the coin flip correctly, you will be paid out 2X your side bet. Payouts are displayed on the Paytable. Payline wins are multiplied by the bet per line. Highest win amount is paid on each selected payline. Scatter wins are multiplied by the total bet and added to payline wins. Feature wins are added to scatter and payline wins. Winning combinations pay from left to right only, except for the Scattered Baby Dino (which pays any). The Cave Girl symbol will substitute for all symbols except for the Scattered Baby Dino symbol. Dino Delight is a video slot that actually has something to offer that most other slot games don’t have – side bets. It certainly makes playing the video slot even more interesting. Aside from that, there is also a bonus game that can lead to a free spins feature. The icing on the cake is a bunch of great payouts, including the 10,000X top jackpot. Dino Delight is definitely a delight and a very pleasant surprise. To play it, you can sign up and make a deposit at [Americans: Unfortunately due to legal restrictions you are unable to play at any of the online casinos this game is at. We recommend you trying playing the unique slots at Win A Day Casino instead.]! Can players from the United States play the Dino Delight online slot game? Players who are based in the United States of America cannot play Dino Delight for real money at this time. For a dinosaur-themed video slot that players from the USA can play, you can read our Jurassic Slots Review or play it at Millionaire Casino. Can I play a Dino Delight Flash game for free? 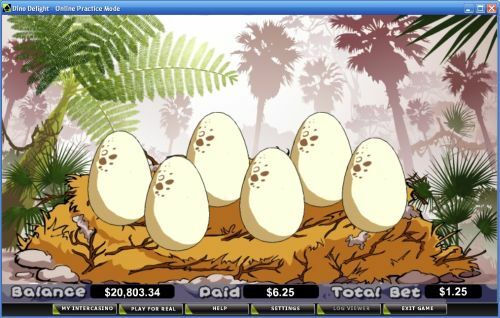 Unfortunately, you can only play the Dino Delight Flash game for real money at [Americans: Unfortunately due to legal restrictions you are unable to play at any of the online casinos this game is at. We recommend you trying playing the unique slots at Win A Day Casino instead.]. If you experience any issues with the Instant Play casino software, make sure you have the latest version of Adobe Flash Player installed on your computer.